Seven Falls is just 10 minutes away from downtown Colorado. Did you know that this attraction is considered "The Grandest Mile of Scenery in Colorado?" This is as well close to Garden of the Gods...neighboring places, so if you're visiting Garden of the Gods, you can do visit the falls as well with just a minimal fee. 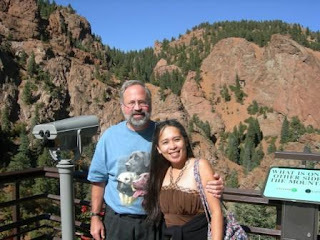 Seven Falls is very colorful during the night, but it so happened when we visited the falls, it was daytime. But you can still see a dynamic view of the scenic mountains. You can go to the top via elevator where a 360 degree viewing camera is located. There is also a small shop there for your souvenirs if you want to buy some. Just beside the falls is a a 224-step stairway that leads up to "Midnight Falls". I haven't tried this yet, but hopefully, we can go back there and try it :). 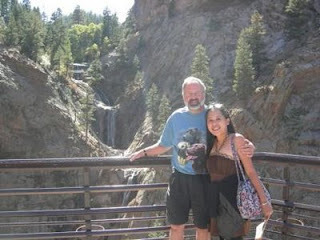 Well, if you are considering this itinerary, visit SEVEN FALLS website.